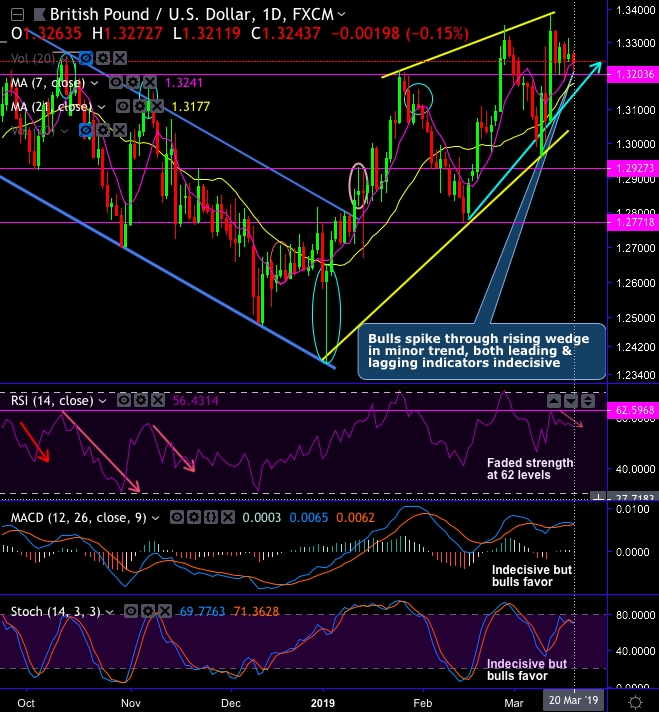 Technical chart and candlestick patterns: GBPUSD (cable’s) interim uptrend has formed a rising wedge pattern on daily terms. The current price is trading at 1.3231 levels with mild weakness. While both leading and lagging indicators are indecisive, hence, there’s no clarity in the signal even though slight biasness is with the uptrend. For now, although cable’s current price sentiments are attempting to build on the rebound from the lows of 1.2373 region where the formation of the hammer is visible, the bullish sentiments in the minor trend can be hampered as it showed failure swings at the channel resistance. 1.3340 level is still perceived as the major barrier for further upward movement. 1.3203 - 1.3176 region now acts as strong support (crucial supports). But the prices are back under pressure at around 1.3272 levels, after grinding back towards the top of the recent range. After the failure swings at channel resistance, risking slumps below crucial supports can also drag up to 1.2927 levels. On a broader perspective, we saw the resumption of the major downtrend after brief consolidation phase, slumps below EMAs are observed upon shooting star formation. For now, the trend is on the verge of retracing 61.8% Fibonacci levels. Overall, from the last couple of days, bulls have been attempting to hold onto the strong support at 1.2702 levels, but it is unwise to buck the major downtrend as we are yet to get better clarity from the technical indicators. Trade tips: Well, on trading perspective, at spot reference: 1.3228 levels, contemplating above-explained technical rationale, it is advisable to trade barrier option strategy using boundary strikes, upper strikes at 1.3273 and lower strikes at 1.3176 levels, the strategy is likely to fetch leveraged yields as long as underlying spot FX remains between these strikes on expiry duration. Alternatively, on hedging grounds ahead of Fed and BoE monetary policies, stay short in GBPUSD futures contracts of mid-month tenors as the underlying spot FX likely to slide southwards 1.28 levels in the medium-term. Currency Strength Index: FxWirePro's hourly GBP spot index is inching towards -55 levels (which is bearish), while hourly USD spot index was at -36 (mildly bearish) while articulating (at 11:29 GMT).